Today was Day #3 of Chocolate and Butter Theme Week. great base for meat and vegetable entrees, as well as caramels and sweet and savory desserts. 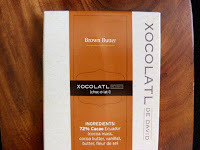 The brown butter in this case was fully incorporated into today's dark chocolate bar. This nicely wrapped, but unadorned Brown Butter bar from Xocolatl de David (Portland, OR) was made with 70% cacao from Ecuador. Two butters, more shine. The brown butter may have contributed some dazzle, but shine like this comes from optimizing the crystalline structure of the cocoa butter, during heating and tempering. 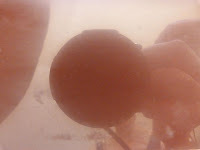 If you have a black belt in tempering, your chocolate will have a glossy surface and snap to it, like this. 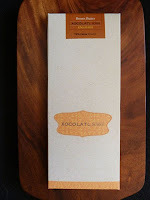 If not, your bars and truffles may have a dull matte, or less attractive, finish; and they may break or crumble more randomly. This camera-ready bar melted in my mouth, like buttah. 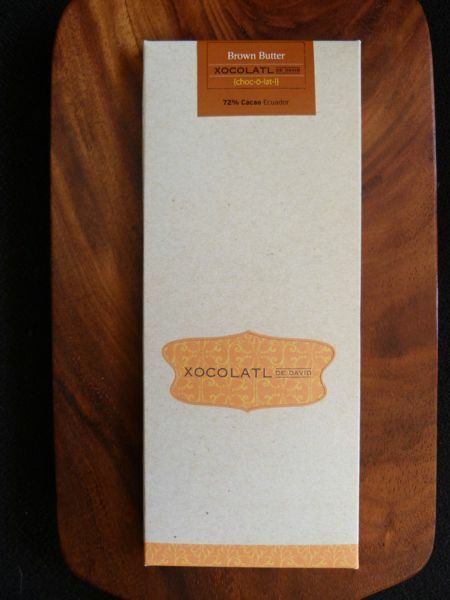 Xocolatl founder, David Briggs, has talked about his interest in savory additions to his chocolate bars (bacon, truffles, chicharrones, cheese, olive oil). I love it. David, I consider you a fellow umami-arian and, as such, I continue to look forward to any new items you create in this category. Keep up the great work!